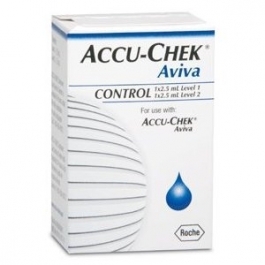 The Accu-Chek Aviva Control Solution is used to test the accuracy of your meter and test strips. Applied to a test strip, control solution confirms that the meter's test results are in the expected range printed on the test strip vial. Control solution tests should be performed at least once a week, every time a new vial of test strips is opened, and whenever you suspect the meter or test strips may not be functioning properly. Using the control solution is also recommended for teaching or learning how to test with your Accu-Chek Aviva Meter. 1. Apply a drop of control solution to the test strip instead of a drop of blood. 2. Compare the results to the control range (you can find the range on the side of the vial of test strips). 3. If the results are inside the range printed on the vial, your meter is functioning correctly. 4. If the results are outside the range, you should call the manufacturer of your meter immediately. Store between 36°F (2°C) and 90°F (32°C). If you have a question or comments about this product, please call 1-800-858-8072 or visit www.accu-chek.com. I tested this a found it to work, exactly as prescribed.